IMPRESS (Integrating Metacognitive Practice to Ensure Student Success) incorporates metacognition into the study of science, technology, engineering and mathematics (STEM) studies. IMPRESS reaches students through three programs: a summer experience for 20 incoming 1st-year students each year, engaging them in authentic scientific practice and reflections about learning, knowledge, self-assessment and identity, a 1st-year course “Metacognition in Science” in which 48 students apply metacognitive ideas and strategies to their concurrent STEM classwork, and a Learning Assistant program that positions students as classroom leaders helping other students master content. IMPRESS is designed to increase retention and performance, with deaf/hard-of-hearing and first-generation students a model for applications to the more general RIT population. 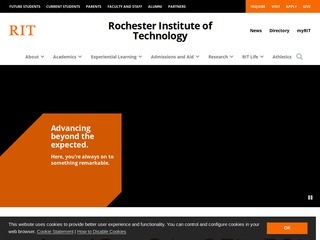 I am a Professor in the School of Physics and Astronomy and Director of the CASTLE Center for Advancing STEM Teaching, Learning & Evaluation at Rochester Institute of Technology. My research includes a variety of topics in student metacognition, including characterizing student reflections and instructor feedback, accuracy of student self-evaluation, and communication modes in mixed hearing/deaf/hard-of-hearing groups. My development of IMPRESS led me to Berkeley’s Compass project, and the collaboration their current and past participants led naturally to the Access Network.